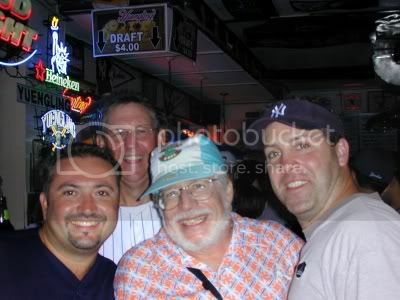 As some of you may recall, I celebrated bar number 750 at Duff's. You might find this link interesting. Duff's is, as you will see, quite a place. Decided to spend another day close to home and let me tell you, a walk up Court Street can be downright scary. Imagine, if you are a little kid, coming across this, almost as big as you, pig. Spooky if you ask me. But being a brave Bar Man I passed on by and made my appointed rounds. 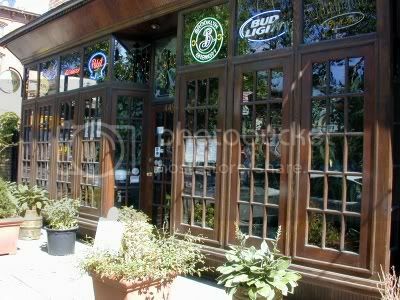 Located at 449 Court St. on the corner of Luquer Street is one of the older, if not the oldest, bar in Brooklyn. It was established in 1871 and some of the interior fixtures do indeed look as though they date back to that era. Interestingly enough, when I arrived there was a conversation going on amongst of few of the neighborhod old-timers about what a cesspool the Gowanas Canal is. They all seemed to think it was worse in the old days though when people used to dump horse carcasses and, on occasion, human ones as well in there and the rats were downright dangerous I wonder if these guys know Louie from Sam’s. Probably. There is a nice old wooden bar in here with an ivory colored marble arm rest and matching marble columns in front along with ornately carved wood. There is also the much beloved brass rail. A beer station with eight spigots serves up a somewhat ho hum selection of beers. There is a very ornately carved wooden bar back with more marble columns, two at each end with an oval mirror between them. There is a large rectangular mirror in the center. Tiered shelves with bottles and glasses are behind the bar. 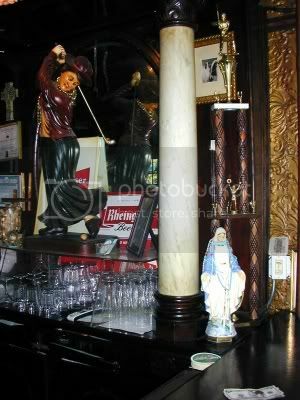 There is a large statue of an elegantly dressed woman golfer taking a swing and a smaller statue of the Virgin Mary at one end of the bar. American flags, Yankee and Mets pennants are tucked around the edges of the mirrors behind the bar. A couple of unlit lamps with orange Rhinegold shades flank the mirror. The lights over the bar back have small stained glass shades. The ones over the bar are dome shaped white glass in metal fixtures that look like they are being supported by metal webs. A partition topped with ornately designed frosted glass separates the bar from tables along the wall opposite the bar. Very interesting light fixtures hang over those tables, mottled dome shaped glass shades each flanked by five smaller upturned lamps with dark cone-shaped shades. The ceiling is copper-colored tin with hammered designs. The floor is patterned mosaic tile. Ceiling fans push the cool air around and it is quite pleasant in here, especially because I get to listen to the old-timers talking and can watch women’s pool on one of the three televisions. 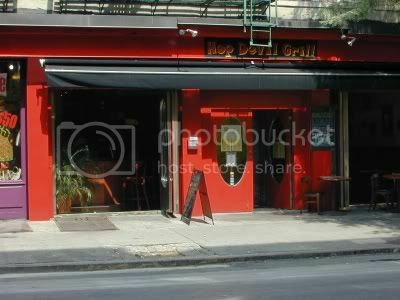 There is a large and very nice outside area with tables and chairs on the Luquer Street side. I had a Brooklyn Lager. Closer to home at 307 Court Street is this surprisingly nice narrow Italian restaurant and bar. Just a small L shaped bar up front with a well polished dark wood top and sides. The six bar chairs are dark wood as well and have nice floral patterned cloth seats in shades of tan. The kind of fabric you might find on an old sofa. A bright round beer station with four spigots sits on the bar. The bar back was also L shaped so it defined a small space for a bartender. The long side was dark wood with mirrors with glass shelves for bottles. They sat above a wooden topped set of shelves that held more bottles and glasses. The short side had a mirror with glass shelves in front of it above a cooler. The glass shelves held more glasses including a row of assorted martini glasses all of which had crooked stems sitting on the uppermost shelf. The floor was nicely tiled in shades of pink and the tables had pink marble-like tops. Floor to ceiling windows opened onto Court Street, and open they were. It was a hot day and the overhead fans didn’t do a whole lot to cool the place down. A couple of tables spilled out a bit onto the sidewalk and sat under red umbrellas. The floor opposite the bar and all the way back is brick and a couple of gold framed mirrors, pictures of flowers, and a number of decorative plates hang on it. There is a nice dining area in the back with a fireplace against the back wall and a large mirror hangs above its mantle. 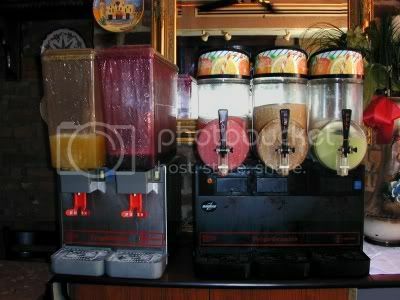 There were somewhat out of place looking frozen drink and juice machines opposite the bar. I discovered that this restaurant is attached to the pizza place next door and they advertised the drinks. I wandered over there and it just looked like they didn’t have any room for the machines so that is why they were parked next door. 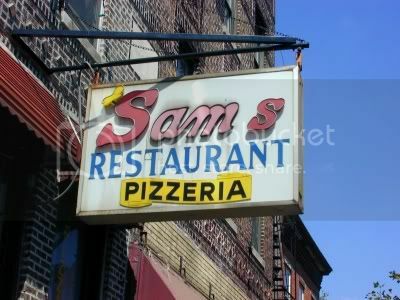 I had a slice of pizza while I was there and if you like thin crispy crusts this is the place to go. If you don't want a soft drink from next door you can get a beer in here instead. Before going next door though I sat and had a Tanqueray and tonic while watching what looked to be a cross between Judge Judy and Jerry Springer in Spanish on the television. A bit of a lazy day with two bars hit moving me up to 772 for the year and leaving 228 to go. I will be taking a few days off over labor day. Going to my sister-in-law's house in New Jersey and doing the smoking and grilling for the family's Labor Day party. I got a 12 pound beef brisket that I smeared with mustard and then applied my homemade rub. I will let that be absorbed for about 12 hours and then smoke the whole thing for about 16 hours. It should be yummy. Of course that gives me 16 hours to drink beer while I keep an eye on my work in progress. I went out to order a brisket to smoke for a family barbecue and walked by a place close by that I hadn’t visited yet but always wanted to pop into, Sam’s. 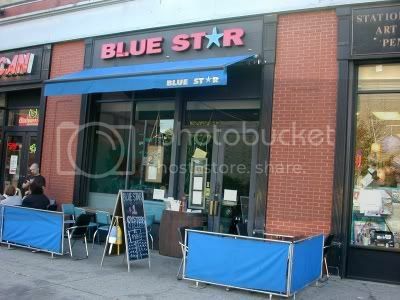 I also saw a new place, Blue Star, that didn’t open until later so I figured I would visit Sam's and then head out again in the early evening. 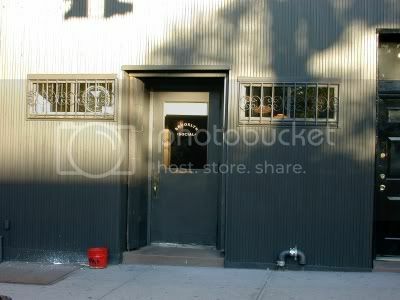 That also gave me a chance to stop into another place that doesn’t open until later, Brooklyn Social. 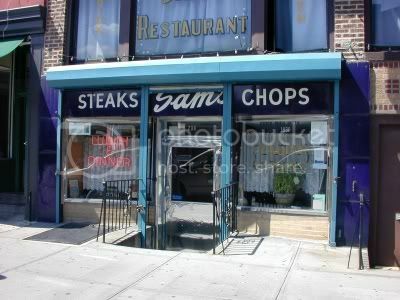 Not far from Staubitz Market, one of my favorite butchers, is Sam’s at 238 Court Street. This place has been around since 1930 so it is a real neighborhood place. When I got there it was just opening up so I had plenty of time to talk to Louie whose father owns the place and still works there at times. Louie was quite a character and grew up not far from here. We had a most interesting discussion about what would happen if a big hurricane ever hit New York. He is an avid boater and knew a lot about past Nor’easters and the topography of New York. He had some very interesting opinions, particularly about what would happen when the Gowanus Canal backed up, among other things. The Gowanus Canal is in the heart of downtown Brooklyn and is, to put it mildly, a cesspool. In fact, it is at least six blocks from Court Street and because yesterday was hot and humid and the wind was blowing the right (or wrong) way, you could smell it from there. But, I digress. The bar has no stools or chairs but enough room to stand and have a drink. No foot rest either. There is an illuminated half-circle overhang above it. Behind the bar are just some shelves holding the liquor in front of an old mirror. There are two statues of young boys sitting on swings hanging from the ceiling and they each hold a small lantern that provides a bit of light. Sitting on one end of a bar was an arrangements of plants that had what looked like memoriam cards and an American flag inserted among them. To the right of the bar, closer to the door, are two very old wooden telephone booths with glass paneled doors that are now being used for storage. The wall opposite the bar is lined with booths with bright red seats and backs. The tables have blue tablecloths with a white linen napkin positioned as a diamond in the center. They are covered with clear plastic though so your arms stick and if you spilt your drink it would just run off into your lap. Small white statues and green containers of pink flowers sit on a ledge next to the booths. A replica of Michelangelo’s David probably served as an inducement to order their sausage and meatball special. On the wood paneled walls above the ledge are pictures of Italian gardens, street scenes, and seascapes. A small overhang above them has clear plastic panels with small fluorescent lights behind them. There are also tables in the center of the floor similarly decked out with the plastic covered tablecloths and another room in the back. The floor is light and dark tile and the ceiling is the kind of tile you often see in basement recreation rooms. 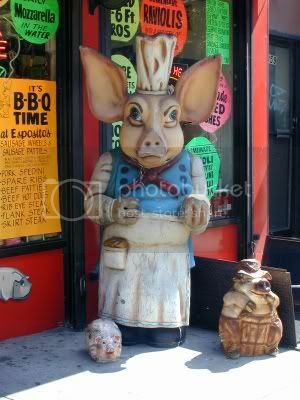 As I said, this is an old neighborhood place and you can see by the way Louie interacts with the customers that he must know them all, or will before their visit is over. 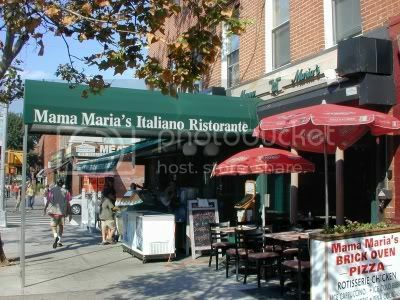 A real classic Brooklyn Italian restaurant and well worth the visit if you want something a bit more authentic than the newer places over on Smith Street. I had a Brooklyn I.P.A., straight from the bottle. Louie was drinking a Manhattan Special Espresso Coffee Soda. Up the street at 254 Court Street and right next to American Beer Distributing Company, one of Bar Man’s favorite places to shop for beer and where I picked up some Aecht Ochlenferla Rauchbier (Original Schlenkerla Smokebeer) for the weekend, is this seafood restaurant and bar. It is fairly new and has, well, a somewhat eclectic décor. You can tell it is a seafood place by the mounted plastic fish mounted on the overhang above the wall opposite the bar and the old harpoon hanging on the wall. On the wall up front is another mounted fish and a wood silhouette of the hull of a boat complete with portholes. On the other hand, there is a large space themed painting with what looks like planets and shooting stars on a white speckled black background behind the bar. At one end of the bar is a display of crab legs and oysters below a fishmonger type scale hanging from the ceiling while on the other end of the bar is an old wooden spinning wheel. Below the over hang opposite the bar are large round planet-looking wall hangings with more shooting stars. And some of the mounted fish wear straw hats for some reason. The bar hass a light grey shiny plastic top with a light and dark turquoise mosaic front. The foot rest is light sea-foam green blocks. The seats are chromed diner style stools with turquoise seats. There is a line of turquoise benches opposite the bar with tables and chromed chairs with matching turquoise seats in front of them. The walls are bright turquoise above blue and white mosaic that matches the front of the bar. Up front is another turquoise bench with the same table and chair setup and five small tables with a couple of chairs each. The setup behind the bar is fairly simple, just shelves and tiered shelves of liquor and there are old fashioned looking inverted helmet shaped white glass lights hanging from the ceiling. Kind of a funky looking place but neat in its own way. They have live music a couple of nights a week and $1 beers to go with your oysters. A small outside seating area as well. I had an East India Pale Ale. Over at 335 Smith Street is this former prohibition era speakeasy and subsequent Italian social club that doesn’t look like it has changed much over the years. Narrow and dark and easy to walk by. Dark wood paneling lines the bottom half of the walls with yellowish cream colored plaster above. A few benches with black seats are tucked into three corners and black round tables with a single wooden chair each sit in front of two of them. Old photos of what looks like former club members adorn the walls and there are a few trophies circa 1970’s in some small shelves. The bar is a nice dark wood and has a dark wood footrest. There are chromed bar stools with black seats. Old fashiioned fat disk shaped white glass lights hang above the bar. They make some classic, and maybe not so classic, cocktails here and use fresh ingredients. In fact a glass filled with fresh rosemary sat in front of me and its smell permeated my immediate area. Kind of weird, the place looked like I should be smelling of stale cigarette smoke. They use the rosemary in a drink called an Almalfi (don’t ask). The ceiling is red hammered tin and the floor is plain tan linoleum. There is a pool table in a small back room whose walls are covered with black and white photos of boxers. There is a small outdoor area with benches beyond that. The bar back sports a large distressed mirror with an old looking wooden frame with chipped paint. Below that are tiered shelves for the liquor that sit atop an old set of wooden shelves holding glasses. On each side of the mirror are two small semi-circular wooden shelves mounted on the wall holding a couple of bottles and above the mirror is a large old clock. There is also an old faded pea-soup green refrigerator back there. I had a Brooklyn made with straight rye whiskey, orange brandy, and a dash of bitters. It was a bit sweeter than I expected it to be, but not bad at all. A nice little neighborhood jaunt with three places visited bringing my total for the year to 770 and leaving 230 to go. There does seem to be a light at the end of this tunnel. Today was a quicker day than I had planned. I was going to head to a few bars on the East side but the subway was being held in the station due to a sick passenger in the train ahead of us at the next station. At least that was what was announced. After sitting in the train for about 10 minutes I heard the west side train pulling into the station so I bolted for that one and took it up to Madison Square Garden and hit a couple of bars right outside. 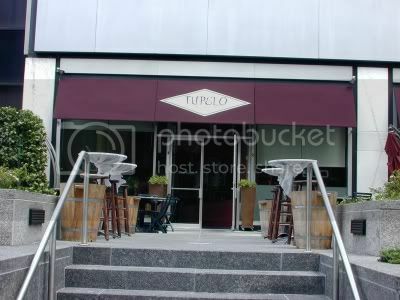 Tupelo is right across the street from Madison Square Garden and Penn Station. It has a dark green marble-topped bar with a light and dark wood paneled front and a grey slate footrest. A silver T shaped beer station with 6 spigots sits on top. 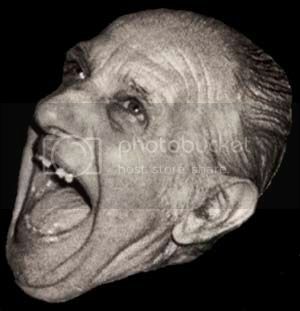 There is a large colorful picture of Earnest Hemmingway’s head on the wall behind the bar (the picture is on the wall, it isn’t a picture of his head on the wall). 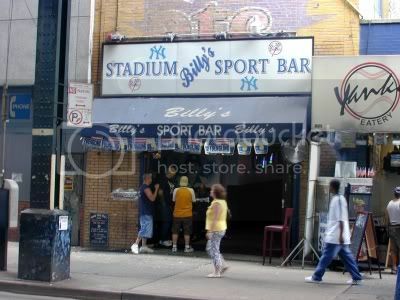 On the wall to the right of the bar is a slightly smaller picture of Babe Ruth done in the same style and at an angle to that is a larger picture of Bobby Jones with the caption “How To Break 90). The bar back has three combination wooden shelves and wine racks separated by glass shelving holding the liquor. Below the bottom glass shelves are tiered shelves holding more bottles. Below are metal coolers with glasses sitting on top of them. On a shelf above each of the three wine racks are iron framed glass candle holders each flanked by a couple bottles of wine. There is a framed poster advertising Strega (one of Bar Man’s favorite after dinner drinks) and one for Bull-Dog Cigars that are, apparently, “Hard To Beat” on the wall between the candle holders. On another wall is a large portrait of John Wayne from the movie “The Searchers.” A television is mounted high in the corner to the right of the bar with the U.S. Open showing. More wine bottles along with what I hope are plastic ferns and vines are on ledges mounted high on the walls. The rest of the fairly large space is broken into dining areas and looks to be quite fancy. The bar was all set up with white linen napkins, China, and silver when I walked in but most of it got pushed to the side when the drinking crowd showed up. I had a draft Samuel Adams Boston Lager. 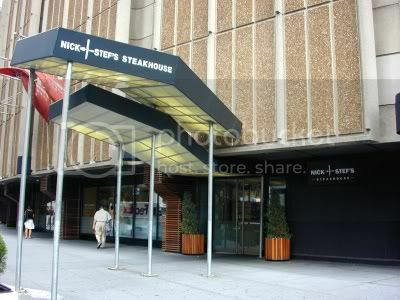 Right across the street from Tupelo and in the same building as Penn Station is this elegant, modernistic steakhouse. 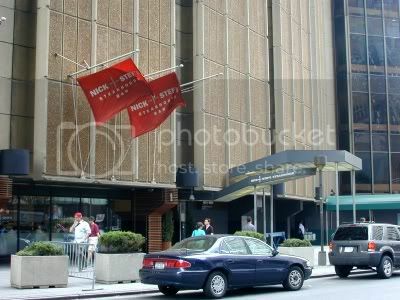 The green awning to the far right is an entrance to Madison Square Garden. The dining area is well separated from the bar. You can just glimpse some of the diners and hear them, but it is a kind of a cheerful background babble, soothing rather than intrusive. The bar is a large, very irregularly shaped affair with a gray and white mottled marble top, a dark wood front, and a gray footrest. Rectangular tannish orange glass shaded lights hang over the bar. There were three televisions that I could see from my vantage point and all were tuned to CNN’s coverage of the aftermath of hurricane Katrina. There have been reports of a three foot shark swimming in the streets of New Orleans which makes me wonder what happened to the aquarium. I don’t recall hearing anything about it. The had to shoot an escaped sea lion from another park in different town though. There isn’t anything too fancy behind the bar here, glass shelves for liquor and two beer stations with three spigots each. Metal coolers and shelves below that and under the sides of the bar. Functional, but not too pleasing to the eye. The ceilings are very interesting though, angled light wood. The walls are pale yellow with a fairly eclectic assortment of framed black and white photos mounted here and there. This used to be a Charlie O’s but Nick is making much better use of the space. Like I said, just a quick trip and a couple of bars making 767 for the year and leaving 233 to go. 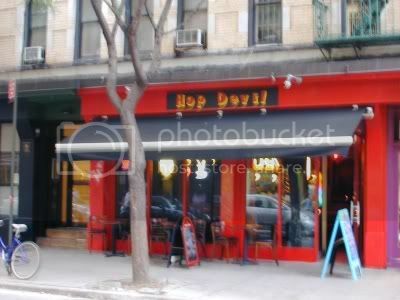 Next door to the "other" Hop Devil and connected to it through a hallway is this separate bar that sells only Belgian and Belgian style beers. It has a separate entrance from the street and there is a store between the two sides so, in my book at least, it counts as a different bar. 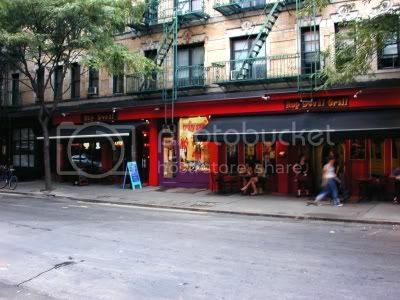 It is smaller on this side and has the dark ambience of one of the old “brown” bars in Amsterdam. I was talking to the Steve, the manager, and he said that was the kind of feel they were aiming for. The dark wood bar is fairly small with plain wood barstools and just a narrow foot rest. The back bar is a combination of a curved set of shelves holding the various styles of glasses that one uses to serve the various beers. There are some carved statues of what I guess are Belgian elves on the upper shelves. This little section is the only really well-lit area in the bar and it is where Erin plies her trade. Actually, Erin was my bartender yesterday too, but she didn’t want me to take her picture then. I must be losing my touch; it took me two days to talk her into it. She is very nice though and fun to talk to when she isn't too busy. The owner was here too and he, along with the manager, were both very pleasant and conversational. We had quite a conversation about bars and beers. Also behind the bar is a large cooler with glass doors where the bottled beers are kept. Bare orange light bulbs hang from the ceiling by electrical cords and there are a few orange lights with somewhat of a nautical look to them hanging on the walls. There are a couple of round wood tables with chairs and booths along the wall opposite the bar. The other bright spot here is the flashy internet jukebox in a corner behind the booths. There is also a Big Buck Hunter machine in the back that looked a bit out of place. The ambience was definitely old European and once my trek of a thousand bars is over I can see myself spending some serious time here. Belgian beers are a bit pricey, some over $25 a bottle, although we are talking a good sized bottle. I kind of view it like drinking a nice wine though, especially if you drink it with a nice bowl of mussels. I had a bottle of Bink Bloesem and the Mysterious Chinese Woman had a glass of Peche Lambic. The Pech Lambic is a low alcohol, 2.5% , peach flavored beer, a bit too sweet for my tastes unless you had a glass after dinner as kind of a dessert. Mine was a bit more robust with a bit of a pear back flavor to it, but nothing overpowering. Steve then gave me a draft St. Bernardus ABT 12 to try and it was very good indeed. It is a quadruple and that means it is stronger and generally has more flavor than the other styles. And flavorful it was. It is very dark and has a nice creamy head. You wouldn’t want to just pound these down but a great beer. That is another thing about Belgian beers. Even though they are expensive they are also strong and so flavorful that you tend to drink them slowly. For the price of two or three rather, in my opinion, bland domestic beers you could get one really good Belgian beer that would last just as long (and have as much alcohol too). Finished up my beers and headed down the street to Jules, a French bistro I had visited before. Had a nice bottle of wine, a good dinner, and listened to some great live jazz. It was kind of like I made a quick trip to Europe tonight. Just one bar today bringing my total to 765 and leaving 235 to go. Well, perhaps I didn’t quite finish it off, but the only bars left that I haven’t visited weren’t open yesterday. Maybe it was too early. Can’t be more than a couple of them anyway and I will pick them off one evening in the not too distant future. Quite a ways east at 118 St. Marks Place, almost to Avenue A where it ends at Thomkins Square Park, is this Irish pub named after the patron saint of mental illness. There is a social club in Dublin with the same name and it is specifically for people who have experienced “mental health difficulties.” Seems like an appropriate enough name for a bar. There is an old wood bar with a brass rail in this fairly small space. The walls are primarily a light green as is the ceiling. The wall behind the bar is more of a desert rose. There was a nice vase of flowers on one end of the bar and a television that was turned off. A beer station with 9 spigots sits on the bar and it has a decent variety. The lighting overhead is track and there are old gaslight fixtures on the walls that now have light bulbs in them. The windows in front have wood panes and the flooring is wooden planks. Tables and chairs make up the dining area. While I was there someone ordered the Irish breakfast and it looked very good indeed. There is a nice little outdoor seating area in the back. I spent most of my time chatting with the bartender, mostly about real estate. He lives in a neighborhood not too far from me in Brooklyn. I was surprised to hear that housing prices are even higher in Dublin than in New York. And we are talking New York City here where a million dollars buys you a fixer-up in a suspect neighborhood. Ah me, where will it all end. My solution was to have a draft Kirin and move along. This is a relatively new place across the street from St. Dymphnas that was built into an old space so some of the original fixtures are still in place. The bar is new and has a heavy well-polished light wood top and kind of a matching plywood front. The foot rest is rough wood with metal trim. They have a great selection of bottled and draft beers. 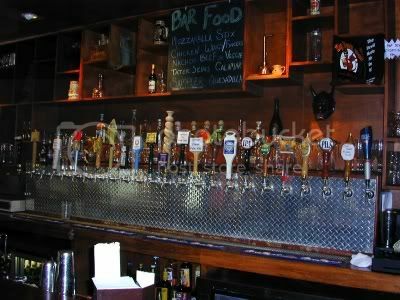 The draft beers are pulled from 24 spigots mounted behind the bar above a patterned metal splash guard above a long drainage trough. All of the draft beers looked good and they had a few I had never seen before. Above the spigots is kind of a cubby-hole set of shelves with old beer cans, statues, glasses and stuff tucked in them. On each side of the spigots are tiered shelves of liquor. A small blackboard in the center of the shelves lists their bar food and a large rectangular blackboard above the bar lists the beer selections by country. Maybe I should have had the Layla Dirty Blond Lager from Israel. There are a lot of framed beer ads from days gone by mounted on the walls that are kind of a mottled tan above dark wood paneling. The back area is up three steps and has a bunch of round tables and chairs. 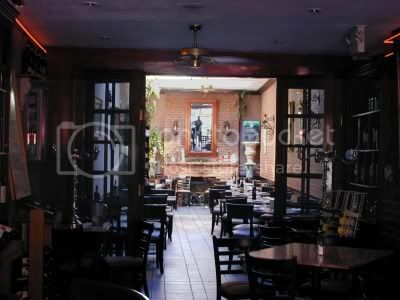 Opposite the bar is a small partition with a fairly wide ledge and a few bar stools in front of it. Above the partition is another blackboard that explains just what a hop devil is. At each end of the explanation the daily specials are listed. On the other side of the partition up against the wall are booths with burgundy seats. The wall next to the large floor to almost ceiling windows and the entryway is hammered tin. Kind of an interesting look. The entryway and red outer door have large oval windows. The ceiling is kind of a paneled mottled tan plastic and there are ceiling fans with lights hanging from it. The floor is interesting multi-colored chip linoleum. Around the back and kind of next door they have another separate bar that only opens later in the evening. 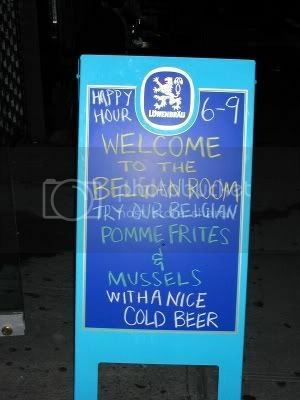 The only serve Belgian style beers at that bar and the bartender said the owners objective was to have the largest selection of Belgian style bars in the United States. I hope he succeeds. I will come back here later in the day sometime and I will count it as a separate bar. From the street side it is actually separated from the other side by a small store and it has its own street side entrance. In fact I think I will go back tomorrow. I had a draft Belhaven Twisted Thistle Ale, quite good I must say. 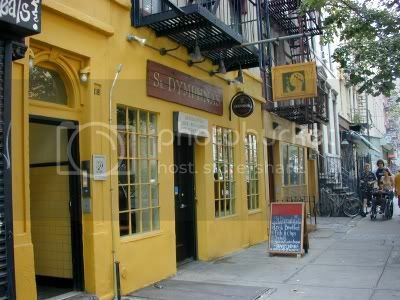 This is just a small place at the end of St. Marks Place on the same side of the street as St. Dymphnas. There is just a small bar with only four chairs, but a bar is a bar. The bar has a dark wood top and a padded red leather front. The bar chairs are wood with a somewhat elegant design and pale green seats. There is a fairly plain, and small, set of shelves behind the bar with glasses and a couple of martini shakers for the sake cocktails they offer. On the top shelf is a plastic pair of clinking beer mugs. There are metal coolers behind the bar. On the left side of the bar are four large and two small sake bottles and s display of eight decorative sake glasses. Above that is a small bamboo mat with white flowers. Above the other end of the bar is a mobile of small Asian fans. The walls are the same shade of pale green as the seats of the bar chairs and the trim around the windows and doors is a brilliant yellow. Mostly track lighting on the ceiling with three large white Japanese style lanterns in the front and a couple more in the back room. 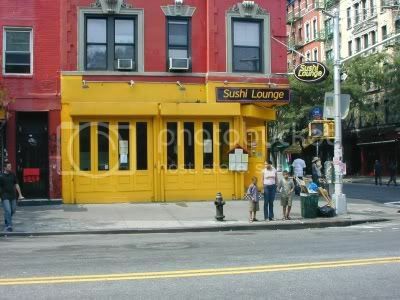 The decorations in the front consist mostly of pictures of different kinds of sushi. In the back the walls are covered with black and white photos of New York. There is, of course, a large sushi bar on the wall to the left of the bar and signs advertising half off on Kirin Ichiban Draft and Sake Martinis. Happy hour runs from 10:00 P.M. until closing. I had a chilled Otokoyama sake and followed that up with a chilled Kurosawa sake. Not a bad day, a sunny stroll down an interesting street and three bars hit bringing my total to 764 for the year leaving 236 to go. 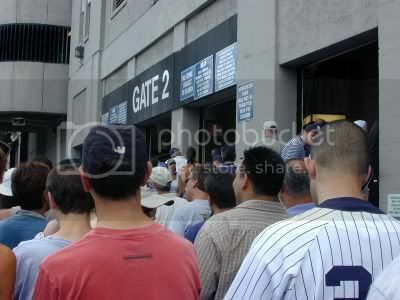 One of the readers of my blog, Allen, was coming down to the Yankees game today with a busload of fans. They rent a bus to make a day of it and before the game stop to visit the gravesites of Babe Ruth, Lou Gherig, and Billy Martin. They are buried in side by side cemeteries north of Manhattan in the towns of Valhalla and Hawthorne. Kind of a nice gesture. We won’t make any jokes about how Billy Martin died sliding into home. Anyway, I was going to hook up with these guys and gals before the game but the bus had a bit of an accident and needed to be towed out of a ditch. As a result I didn’t get a chance to hook up until I got to the game itself. 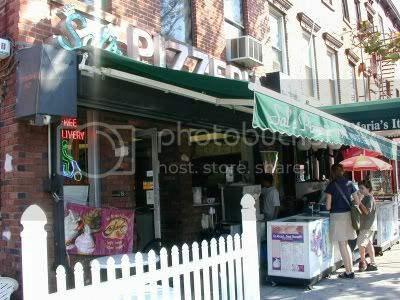 Located on the corner at 72 161st Street is the place where I was supposed to meet everyone. Luckily Allen had the foresight to mail me the ticket so I was pretty well set. Well, I am here and so is a bar so of course I had a drink. I can’t quite pound them down like the rest of the fans in here, I am not in their league. Pretty much beers and shots being consumed at a rapid enough pace to insure a good buzz that will last through the game and thus avoid having to pay for beers inside the stadium. The bar has a blue vinyl top and front with light wood trim. The footrest is small blue tiles and matches the blue of the blue and white tiled floor. There are four beer stations pumping out the beer and the bartenders were being kept quite busy. 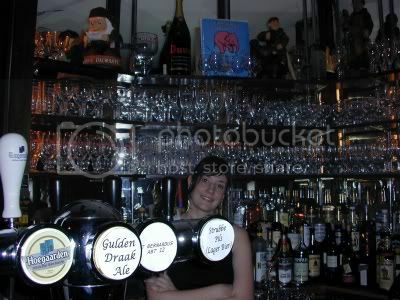 Mirrors and shelves behind the bar. The shelves hold liquor and there are even some racks with glasses but, aside from the shots, everything is served in plastic. No surprise that the walls are plastered with Yankee memorabilia. There are three good-sized televisions behind the bar tuned to the consolation game of the Little League World Series. Vista, California is currently beating Ciba, Japan. The other smaller television is tuned to an old Ali fight. The wall opposite the bar has a ledge for drinks and is being put to good use by the standing room only crowd. There are large overhead fans that alternate with large flying-saucer like lights. There is also a large back dining area but I didn’t make it there. The crowd is starting to thin out a bit as it gets closer to game time but I think I can squeeze in, if I can squeeze into, one more bar. Well, I didn’t have to worry about squeezing in here; it was pretty empty even though it is just a few Yankees souvenir stores down the street towards the stadium. This place was almost empty. It might be partly due to the fact that the game is about to start or perhaps because they charge ten bucks for a small gin and tonic served in a plastic glass. They only had Bombay gin too, either Sapphire or regular. The bar has a nice planked wood top and paneled front, but no stools or footrest of any kind. There were three nice televisions behind the bar where you could, perhaps, watch the game, but you would have to stand for the whole thing. Not my idea of fun, but then I am getting old. The whole place is quite new looking and although there are a few pictures of Yankees players it isn’t really jammed with Yankees memorabilia. The walls are brick and the wall opposite the bar is lined with tables and chairs and, I suppose, you could sit there and watch the game but you are quite a ways away from the televisions behind the bar. There is a fairly large back room and there are more, smaller televisions around the place but none with real good sight lines from anywhere you might sit. Kind of a strange layout for a sports bar and a bit out of place compared to all the others around here. The game has now started and thinking I have missed most of the crowd I headed out after drinking a Bombay gin and tonic. Well, it turns out I didn’t really miss the crowd, more like a ran into an angry mob. Apparently the scanners that they use on your tickets weren’t working so they weren’t letting anyone into the stadium even though the game had already started. As you might imagine, this did not really set well with a crowd, at least some of whom, were pretty well liquored up. Luckily the problem was corrected in about ten minutes so things didn’t progress beyond the shouting stage. Of course I ended up behind someone with two kids that wanted to hold one of them on his lap so didn’t have a ticket for him. This does not work. He had to debate the issue for several minutes before security was called and he was convinced he needed to leave the line and buy another ticket. I did finally get to my seat but Allen wasn’t there yet. Several of his crowd were though and they recognized me so we chatted a bit and Allen arrived soon after. Being a man after my own heart he also decided that arriving late and not hooking up with me was no reason not to stop for a drink or two. 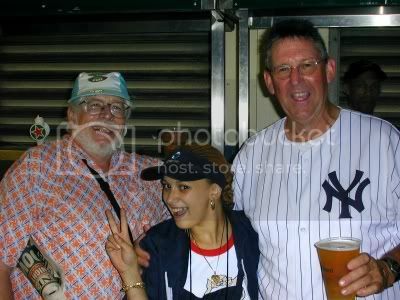 We did have a couple of beers at the game, one of which was served up by the effervescent Tany. 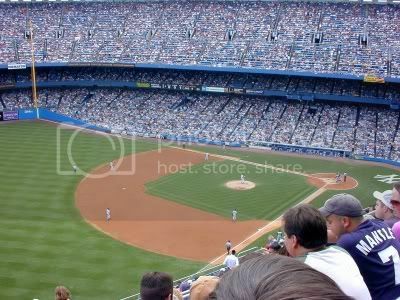 After the game Allen and I headed right across the street from the stadium and wedged our way into this packed place. Now this is a sports bar. The top of the bar is covered with old faded color pictures of Yankees greats protected by glass and the every inch of the paneled walls are covered with pictures of Yankees and memorabilia. The place was too crowded to see much but the bar is a very large rectangle with the liquor, beer, and bartenders in the middle. Everybody in here was whooping it up because the Yankees had just slaughtered the Royals and Giambi had one hell of a day. He had been in a bit of a slump but broke out of it with two homeruns and drove in seven runs. He got his 1000th RBI and 1500th career hit in the game so if you were a Giambi fan it was a great day. Stan’s achieved a bit of notoriety some time ago when someone, after drinking there, managed to find himself on the subway tracks and lost both of his legs to an oncoming train. 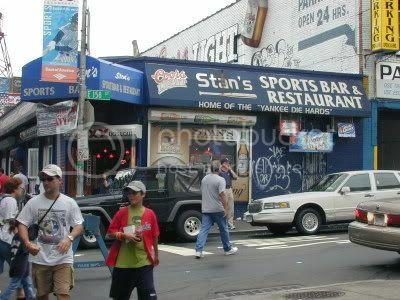 Needless to say there was a major lawsuit involving both the city and Stan’s. I am not sure how it turned out though. Things just weren’t working out quite as planned with Allen and me. After failing to hook up before the game he got a call on his cell phone while we were in here with the news that one of his crew had fallen on the way out of the stadium and required emergency medical attention. He had to leave and help take care of the situation because he was the leader of the pack. I hope we have a chance to hook up again, it was a blast hanging with him. Ah well, I had a Sierra Nevada Pale Ale and drank it out of the bottle like everyone else in here was doing. 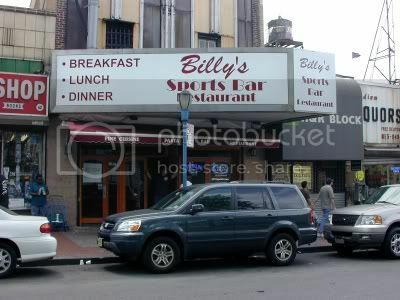 This place is also right across from the stadium and, as it turns out, is connected in the back though a passageway to the other Billy’s Sports Bar. This has a totally different feel to it and is certainly the original with the other one being added later. The one thing that they do have in common though is no seats at the bar. My bet is that this place, at least, gets so crowded that they would just take up much needed room. Kind of just a no frills wooden bar with a few tables and chairs strewn about. Before the game there was a very large guy sitting just inside scalping tickets and the place was pretty emptied out (the game had started). Afterwards it was jammed. 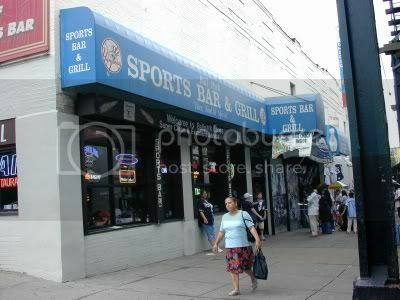 There are a few Yankees pictures and stuff on the wall but this is more of a dive bar than a sports bar, in my opinion. Still, not a bad place to wedge yourself into for an after the game libation. 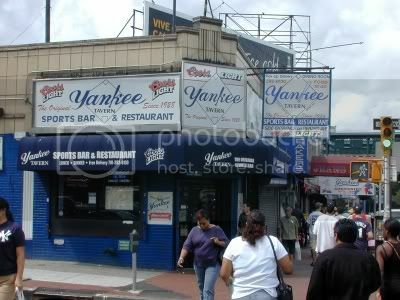 Well here you have it all, a bar, a souvenir shop, and a bowling alley all across the street from Yankees Stadium and all in one building. Quite a decent bowling alley too, a fair number of lanes on one side and a little four lane set-up across from them. It was doing a nice business too. The bar was separated from the bowling alley by the souvenir shop that had a large sidewalk presence and seemed to be the place to buy stuff after the game. Nothing on tap but bottles seem to be the way to go. Kind of recreation room look to the bar with chrome-plated bar stools. Nothing fancy here and not even too much sports related, unless you hit the souvenir shop. Actually, this bar would have been more appropriately located in the bowling area. I had one last bottle of Budweiser before the long ride home. In a better world I would just be able to hop the 4 train and end up just a few blocks from home. But, this is New York. The 4 train was not running all the way into Brooklyn so I had to transfer to the D train and then switch again to the A train. I had to take a similarly convoluted path to get to the game as well. Ah well, all is well that ends well. A very nice day indeed, great game, great people, and five bars hit. Kind of like shooting fish in a barrel though, they were all on a single block and nothing goes better with a ballgame then dumping down a few beers (and one expensive gin and tonic). Total for the year is now 761 and 239 to go. I am going to have to force myself to slow down to avoid hitting number 777 before September 12th.